Far across the solar system, from where Earth appears merely as a pale blue dot, NASA’s Galileo spacecraft spent eight years orbiting Jupiter. During that time, the hearty spacecraft — slightly larger than a full-grown giraffe — sent back spates of discoveries on the gas giant’s moons, including the observation of a magnetic environment around Ganymede that was distinct from Jupiter’s own magnetic field. The mission ended in 2003, but newly resurrected data from Galileo’s first flyby of Ganymede is yielding new insights about the moon’s environment — which is unlike any other in the solar system. 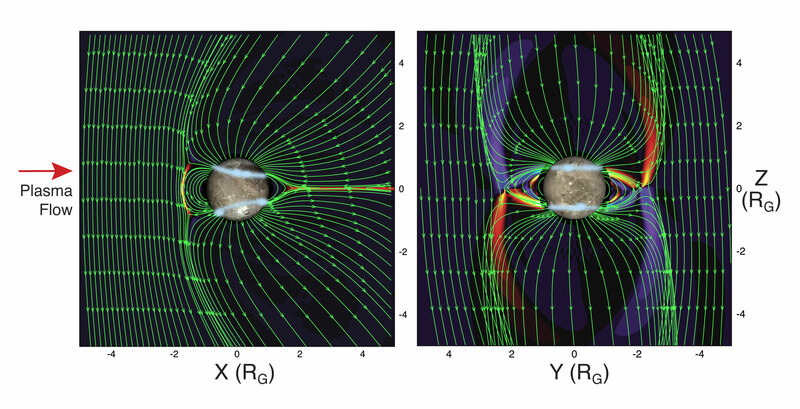 Magnetosphere of Ganymede based on model of Xianzhe Jia (JGR, 113, 6212, 2008), with location of auroral emissions (in blue). We know that Earth’s magnetosphere — in addition to helping make compasses work and causing auroras — is key to in sustaining life on our planet, because it helps protect our planet from radiation coming from space. Some scientists think Earth’s magnetosphere was also essential for the initial development of life, as this harmful radiation can erode our atmosphere. Studying magnetospheres throughout the solar system not only helps scientists learn about the physical processes affecting this magnetic environment around Earth, it helps us understand the atmospheres around other potentially habitable worlds, both in our own solar system and beyond. This infographic describes Ganymede’s magnetosphere. In this illustration, the moon Ganymede orbits the giant planet Jupiter. 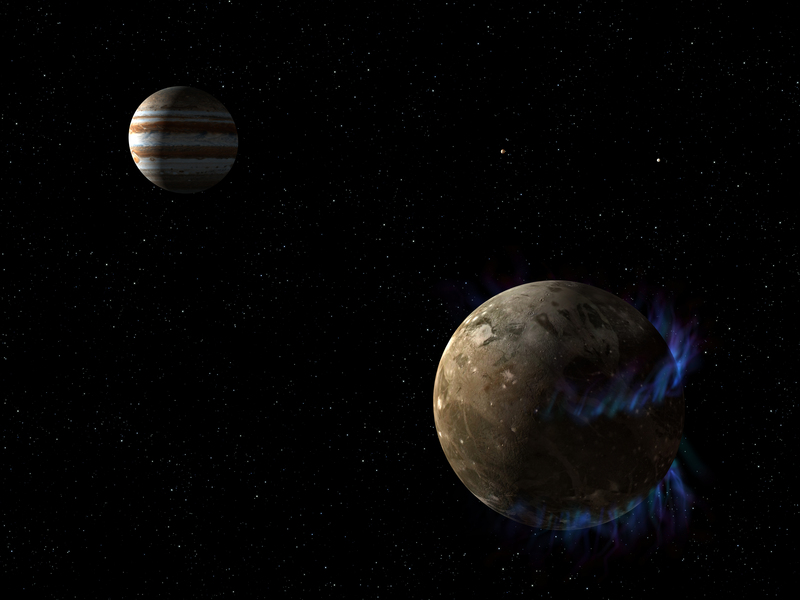 Ganymede is depicted with auroras, which were observed by NASA’s Hubble Space Telescope.